Slingo Quest Game Review - Download and Play Free Version! Are You Ready for the Next Slingo Challenge? Introducing Fun New Ways to Play This Classic Game. Are you ready for the next Slingo challenge? Slingo Quest takes your favorite Slingo game the next level and introduces brand new fun ways to play! Get Super Slingos on the multi-card games. Check out the Bounce Slingos that rebound off of walls. 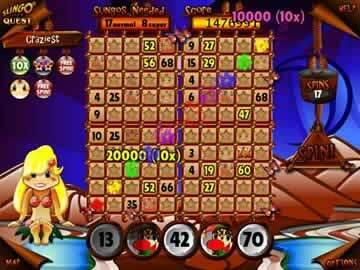 Dual the Pirate for most points in Pirate's Fortune and Seven by Seven Slingo which features a larger game board. New bonuses include Slingo Vision to see the matches right away, Devil Protection that gets rid of devils, and Multipliers which increases your score with every match. Make your way through 60 levels of Slingo fun, each with their own unique game play features. Each island features new bonuses and challenges. High Quality Look and Sound! Top notch vibrant graphics, fun sound effects and 10 Slingo Songs that rotate on each level. Each level has 5 stars to win that provide extra challenge. Can you get them all? If you do something great in the game, you will receive a Slingo Stamp to reward you. Getting them all is a super-challenge and very rewarding. The game will track your score and rank. A top ten list is included for each level. Great way to compete against yourself or others. Help bubbles lead through each game making learning how to play a snap. The game you have known and loved for 10 years is included as an extra bonus! 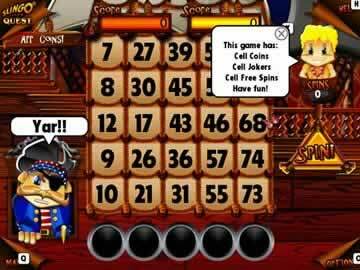 Slingo Quest is a unique mix of Bingo and Slots. It's a fairly simple game that has you matching numbers on a five-by-five card with five random numbers from spinning a row of slots below the card. However, there are a few other things thrown in to add a bit of strategy, such as jokers that can match to any number. Two modes of play give you the option of experiencing new powerups and challenges or traditional Slingo. Slingo Quest is a relaxing and fun game you won't want to put down. You start your game of Slingo with a five-by-five card and a row of five slots beneath that. Each column on the card corresponds to the column of the slot below it. Numbers in a card can only be matched with numbers in the same column from the slot. For example, the number 5 in the first column could only be matched when the number 5 appears in the first column of the slots. Your goal in Slingo Quest is to match all of the numbers in a given pattern. You'll have only twenty turns to complete the pattern, fill as much of your card as possible, and max out your score. Unlike some earlier versions of Slingo, Slingo Quest offers a large variety of levels in the Quest Mode. Each level provides a different pattern for you to complete, or another goal to accomplish. For example, one level pits you against a pirate as you compete to get the highest score in a game of Slingo. Other levels have you tackle cards that are larger than normal (such as a 7x7 card instead of a 5x5 card), or multiple cards at once. In addition to what's required to complete the level, there are bonus and hidden objectives. One such hidden objective is a key placed on every level, which need to be found and collected to unlock bonus levels. Other possibilities include stamps, which are achievements for things such as completing levels quickly. The various goals and objectives add a new dimension of play to Slingo. The levels in Quest Mode are split amongst several islands in the game that each have their own theme and bring a new element to the gameplay. Devil's Isle introduces the possibility of a Devil in the slots or on the board that can cut you point total from 10-50%. Jokersville adds Jokers and Super Jokers, which can be used to match any number. These different islands and powerups add more variety to the game, as well as a bit of strategy. The other mode offered in Slingo Quest is the Classic Mode. You play only a single card at a time in this mode, and there is no pattern to match. Your goal is simply earn the best score that you can. High scores are tracked separately for Classic Mode and each level in the Quest Mode. One possible downside to Slingo Quest is the random elements and that impact they can have on your game. While some people may not mind or may even like the chance and luck involved, others may find it more annoying. The powerups are the main culprit. There is a Devil which will cut your points in half, gold coins that award bonus points, multipliers that increase how many points you earn, Jokers that can match any number in a column, and Super Jokers that can match any number on a card. How lucky you get in obtaining these powerups through spins and on the board can have a huge impact on your score and whether or not you can complete a level or its bonus objectives. As in previous versions of Slingo games, the graphics and sounds in Slingo Quest are very simple. They aren't amazing or exciting, but work well with the rest of the game. The sound cues are helpful when playing. These cues will let you know right away when you've found all the matches, or risk losing a bunch of points to a Devil. Wooden slots on your Slingo card and a colorful tropical background fit well with the island theme used in the Quest Mode. Slingo Quest can get fairly repetitive, although the different patterns and levels do help alleviate the feeling. The hidden and bonus objectives do give the player a reason to go back and redo levels. Some players may also wish to redo levels and work towards new high scores. Other players may not find much incentive to replay or keep playing. This game may entertain you for only a few minutes at a time, or provide hours of enjoyment in a single sitting. Slingo Quest is a fun an relaxing game that anyone could play and enjoy. Unique patterns and levels provide a variety of challenges. A diverse mix of powerups add new dimensions and strategy to the game. This game could be overly repetitive or one of the most addicting games you play. Give Slingo Quest a shot and see if it's the game for you. Catch a glimpse of some of the Slingo fun you can experience in this new challenge.